Bring the stock and milk to a simmer. Whisk in the cornmeal and continue to simmer and stir until thickened, about 15-20 minutes. Meanwhile, lay out the salami on a piece of wax paper. Tile it to create one large rectangle of salami. Spread the polenta on the salami in a thin layer. Chill the mixture in the fridge for about 10 minutes just to let it harden slightly. Roll the mixture the short way to create a long log roll. Place into the fridge for at least 3 hours but preferably overnight. When the log is fully chilled, slice it into 1/2 inch rounds. Shallow fry for about 5 minutes on each side. Be really gentle when flipping because it is fragile. Polenta is an underrated ingredient when it comes to snacks and dips. It could function about a million different ways when it comes to these types of appetizers. Mix it with extra liquid and some cheese and you have a tasty polenta dip. Let it harden and you have a serving vessel for a myriad of slaws or other toppings. Today our snack of choice is a hardened polenta mixture rolled up with some thin sliced salami. 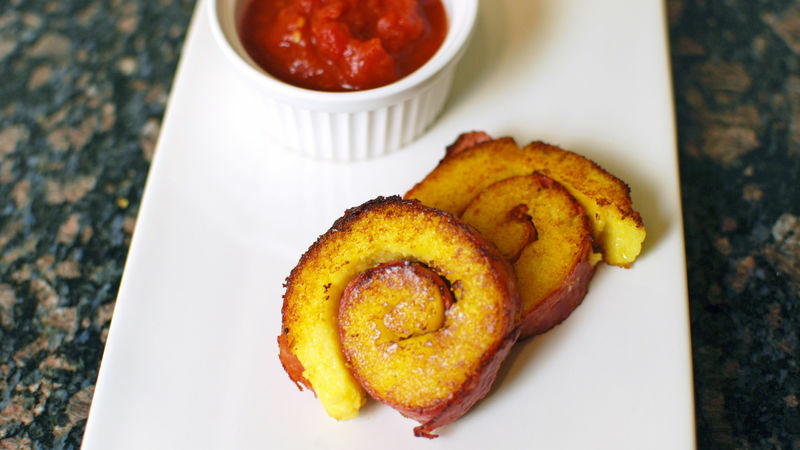 Dip these Polenta Salami Roll Ups in some tomato sauce and you have a fancy yet easy snack that hits everyone’s favorite Italian flavors! First make your polenta. Pour the cornmeal into some simmering stock and milk. Whisk away until it becomes a nice, almost mashed potato texture. Meanwhile, shingle out the salami to form a single layer on wax paper on a baking sheet. Pour and spread the finished polenta onto the salami and toss it into the fridge. After only about 10 minutes in the fridge, it’s ready to roll. Use the wax paper to help roll it tightly. After it sits in the fridge for a few hours, it’s ready to slice. Fry ‘em up for about 5 minutes a side. Dan Whalen wants to open up an Italian sushi joint. He has been blogging for over 4 years at The Food in My Beard; check Dan's Tablespoon profile often to try his recipes with creative international spins!